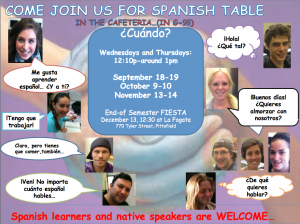 Spanish Table ~ Mesa de español: Wednesday and Thursday of THIS WEEK: 10/9-10/10/13! ¡Nos vemos hoy y mañana! Remember: Students are required to attend three (out of eight) Spanish Table events at lunchtime in BCC’s Cafeteria (for at least half hour each time). 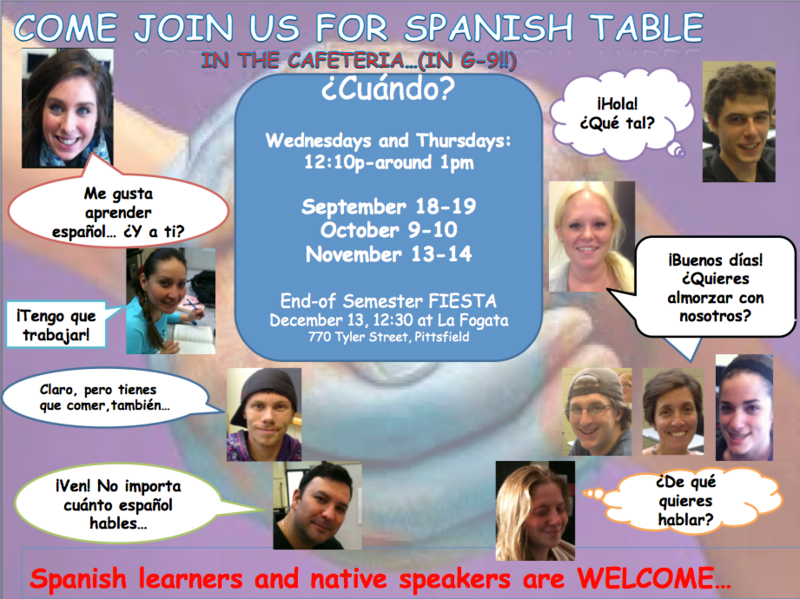 Spanish Table meets one Wednesday and one Thursday each month from 12:10pm until around 1pm. (This is one of the many elements that count for students’ participation grade (20%) in the class. Students are encouraged to bring English or Spanish native speakers to enjoy conversation about Latino music, films, dance, politics… and to meet new friends. Bring your laptop if you want to share for favorite music and YouTube videos on countries you are interested in learning about.